TORONTO, ON – Discovery Channel Canada has announced that they will soon be airing Brew Masters, a reality series focused on San Calagione (pictured) and his team at Dogfish Head Brewery which debuted last month on the US-based Discovery Channel. 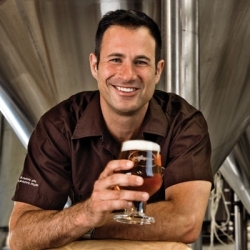 Meet Sam Calagione: maverick, family man, entrepreneur owner of Dogfish Head Brewery, and ambassador to the world of craft beer. Brewing up batches of oddly-named craft beers – and convincing people to drink them – are all in a day’s work. But running a successful business requires inspiration. Each episode of the seven-part series follows Calagione across the U.S. and around the globe as he explores new ingredients and techniques, and collaborates with other craft brewers who inspire him to create innovative new libations. Brew Masters will air on Discovery Channel Canada on Mondays at 10 PM ET/PT, starting January 17, 2011.